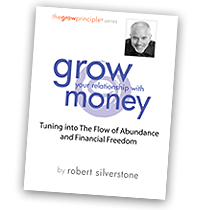 For more than 30 years, Robert Silverstone has been teaching, training and coaching business owners, entrepreneurs and conscious professionals from all walks of life to create the work, life and world they desire – and he can do the same for you. Kurt Krieser, CEO, Evy of California, Inc.
Would you like to live a life of abundance and financial freedom that is available to us all, in any economy? 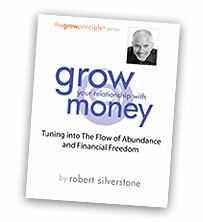 Now is the perfect time for Robert Silverstone’s ‘GROW Your Relationship with Money’ ebook! This 27 page ebook is yours FREE for a limited time, right now!